A couple who posed as Paris attacks victims to win compensation are facing trial again over a similar claim about the Nice attack last summer. The pair were imprisoned in December after claiming €60,000 (£50,000; $64,000) from a victims fund for the November 2015 Paris attacks, despite being in the Cote d'Azur at the time. The fraud was exposed when they claimed to also be victims of the Nice attack. They will now stand trial again in April and face 14 years if convicted. Sasa Damjanovic, 36, and Vera Vasic, 29, claimed they had been at the Stade de France stadium in Paris in November 2015 when it was targeted by a suicide bomber. Vasic said she was "blown back" by the explosion, when in fact the couple were on France's south coast. They later admitted spending most of their fraudulent compensation on vehicles that they planned to sell on, claiming that they had debts to pay off. Damjanovic was sentenced to six years and Vasic three years and they were ordered to repay €30,000 each. They are appealing against the decision. 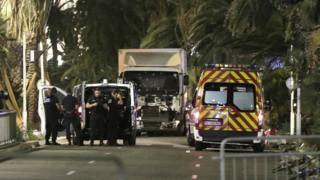 Investigators now say Damjanovic and Vasic also posed as victims of the Bastille Day lorry attack in Nice in a second bid to win compensation. Eighty six people were killed in the attack, when a lorry ploughed into a large crowd watching a fireworks display. The attacks in Paris hit a concert hall, restaurants and bars, as well as the stadium, leaving 130 people dead and hundreds wounded. The trial begins on 19 April. Video Paris attacks: What happened at Stade de France?